Donald J. Fraser has spent a lifetime working in a variety of capacities in government. This includes direct experience in the management of local government organizations and specialized assistance as a consultant. 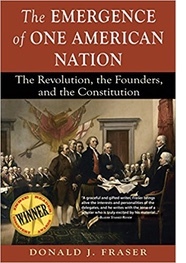 Fraser holds a bachelor’s degree in political science and a master’s degree in public policy and administration and is the author of The Emergence of One American Nation. Rumors swirl around our nation’s capitol like winds through a canyon. In recent days, it has been reported that last year, Donald Trump’s lawyers discussed the president pardoning Michael Flynn and Paul Manafort, both of whom have been indicted as part of the Mueller probe. Constitutional scholars disagree over whether a president can actually use the pardon power in unlimited ways, but to this writer it seems impossible to believe that the Framers of the Constitution, who feared too much centralized power, really thought a president would act in such a way. Alexander Hamilton, the main proponent of a strong and energetic president, indicates in Federalist No. 75 that the chief executive should act with “scrupulousness and caution” in issuing pardons, especially in cases that may involve treason. And one of the framers, George Mason of Virginia, refused to sign the Constitution partly because of his reservations over the pardon power, alarmed that one could be issued “to screen from punishment those whom [the president] had secretly instigated to commit the crime, and thereby prevent a discovery of his own guilt”. 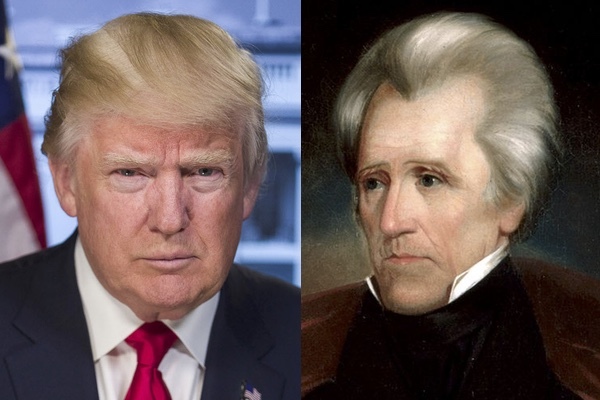 I have been thinking a great deal lately about the comparison between President Trump and his own favorite president, Andrew Jackson, on issues where they have either skirted the law or the norms of our political system. Both men grabbed for power, but while Jackson did it to promote democracy, Trump has done it to promote autocracy. The potential abuse of the pardon power is but one example of Trump’s disdain for the norms of American politics. The president’s autocratic tendencies have been extensively documented, perhaps most comprehensively by the Harvard political scientists, Steven Levitsky and Daniel Ziblatt, in their 2017 book How Democracies Die. They show how Trump has consistently violated the norms that sustain our democratic system. Trump scores high on their test for authoritarian characteristics, including a weak commitment to democratic rules of the games, seeing one’s opponents as illegitimate, the toleration of violence and restricting the civil liberties of critics. Since taking office, Trump has continued with his pattern of authoritarian behavior he exhibited as a candidate. This includes his attacks on the media as “fake news” in order to control the narrative and his attempts to delegitimize law enforcement and security agencies as a means to undermine the ongoing investigations into possible ties between his campaign and the Russians during the 2016 election. Yet our Madisonian system of checks and balances has proven to be quite resilient so far in thwarting Trump’s efforts to undermine liberal democracy, with the sole exception of congressional oversight, where Republican responses have ranged from weak to non-existent. In the case of the House Intelligence Committee, some have described its investigation of the Trump campaigns ties to Russia as a cover up. While Trump has attempted to undermine democratic norms, he has not yet overtly ignored the law (except to the extent his administration has not implemented congressionally approved Russian sanctions). Not so Andrew Jackson, most notably during the bank wars of the 1830’s. Jackson had always had an animus toward banks, debt and credit. Perhaps this dated to his experience as a young man, when he accepted a personal note in exchange for land he owned. When the note turned out to be worthless, Jackson was almost ruined financially. Jackson ran for president in both 1824 and 1828 as an outsider, promising to clean up the “Giant Augean Stable” of Washington D.C. (One can almost hear the echo with Trumps promise to “drain the swamp.) Part of this effort would be the elimination of the Second Bank of the United States. Jackson believed that all banks had an unnatural advantage bestowed on them from their government granted charter. The charter allowed the bank owners to add to their already vast wealth, which they partly used to lobby legislatures and contribute to elected officials, creating corruption in the American political system. (Jackson may have been on to something, given the corrosive impact of money on politics in our day.) Average Americans were the losers in the process, which not only fostered corruption, but endangered liberty, equality and democracy. By killing the Bank, “the purity of American institutions would be reestablished and democracy advance,” his biographer Robert Remini wrote. Running as the National Republican candidate for president in 1832, Henry Clay decided to make re-chartering the Bank one of the core issues in the election. He engineered an extension of the Bank’s charter, which was set to expire in 1836, and dared Jackson to veto the congressionally adopted bill. Jackson did just that, arguing in his veto message that while inequality was natural, he was opposed to laws that “add to these natural and just advantages” any type of “artificial distinctions… [that] make the rich richer and the potent more powerful.” Jackson’s use of the veto was precedent setting and contributed to an expansion of presidential power. Prior to Jackson, only nine vetoes had been issued, and all of these were over strictly constitutional questions. At the time it was assumed that this was the only proper reason for a veto, and that presidents should abstain from interfering in the legislative process. After Jackson, future presidents would need to be consulted on the content of legislation. In the aftermath of the 1832 election, in which Jackson handily defeated Clay, the president began his second and final attack on the Bank. Emboldened by his electoral victory, Jackson now saw himself as “the direct representative of the people.” As Jon Meacham has written, Jackson thought that “the idea of the sovereignty of the many was compatible with a powerful executive” and he wasn’t above using autocratic methods “to preserve democracy.” In other words, Jackson was willing to use authoritarian means (the expansion of his own power) in order to accomplish democratic ends. Jackson’s great fear was that the president of the Bank, Nicholas Biddle, and his fellow board members, would use their considerable wealth to lobby Congress for a renewal of the charter with enough votes to override another presidential veto. The President decided to gradually remove all federal deposits from the Bank, thereby reducing much of its financial power. But Jackson faced a problem. By law the decision to remove the deposits was not the president’s to make, but rather the Treasury Secretary’s. Since the House of Representatives had recently issued a report that federal deposits were indeed safe, any action by the Jackson administration would be seen as violating the wishes of Congress. The President and Treasury Secretary McLane had already had one falling out over the Bank, and McLane (along with other cabinet members) opposed removal of the deposits, fearing that it would damage the economy. McLane also believed that the Treasury Secretary was responsible to the Congress on this issue. The solution? Since Edward Livingston was leaving as Secretary of State, Jackson moved McLane to the senior cabinet position. Jackson then selected William Duane to serve as the new Treasury Secretary, a man known to be anti-bank. But the President made a major mistake, never asking Duane his views on deposit removal. When Duane too refused to move the deposits, Jackson fired him and put in his place Roger Taney, who supported Jackson on the issue and implemented the president’s orders. Jackson paid a price for his expansion of presidential power. For one thing, Biddle engineered a recession by calling in loans, causing damage to the economy. The President’s political opponents, led by Henry Clay, drafted a censure resolution in the Senate against him for “the exercise of power over the treasury of United States, not granted to him by the constitution and laws, and dangerous to liberties of the people.” Clay charged Jackson with leading a revolution that endangered “the pure republican character of the Government.” His ultimate fear was that “the concentration of all power in the hands of one man” – Jackson – was transforming the presidency into an “elective monarchy.” Clay and his supporters would begin to call themselves the Whig party, harkening back to those in Great Britain who stood against the power of the monarchy. In the sometimes bizarre ways of history, this actually strengthened democracy in America, opening up political competition under the second party system that had been submerged during the period of one-party rule during Monroe’s presidency. President Trump may want to heed two lessons from the actions of his favorite president. The first is that there were numerous missed opportunities for compromise over the Bank that could have preserved its role in managing the money supply and acting as fiscal agent for the government, while still strengthening governmental oversight. Over the next 75 years, “the U.S. economy seemed to move from one financial crisis to another,” as the Philadelphia Federal Reserve Bank noted in a December 2010 report on the Second Bank of the United States. Central banking would not appear again until the Federal Reserve System was established by Woodrow Wilson in 1913. The inability of Jackson and Biddle to find some middle ground was a very costly mistake. The second lesson is that the Madisonian system of checks and balances does indeed work. One wonders, if Trump were to issue pardons to those indicted as part of the Mueller investigation, whether he would finally awaken the resistance of congressional Republicans. Such a violation of the norms of American politics, verging on the lawless, might ensure that ambition counteracts ambition, as Madison famously wrote in Federalist No. 51.